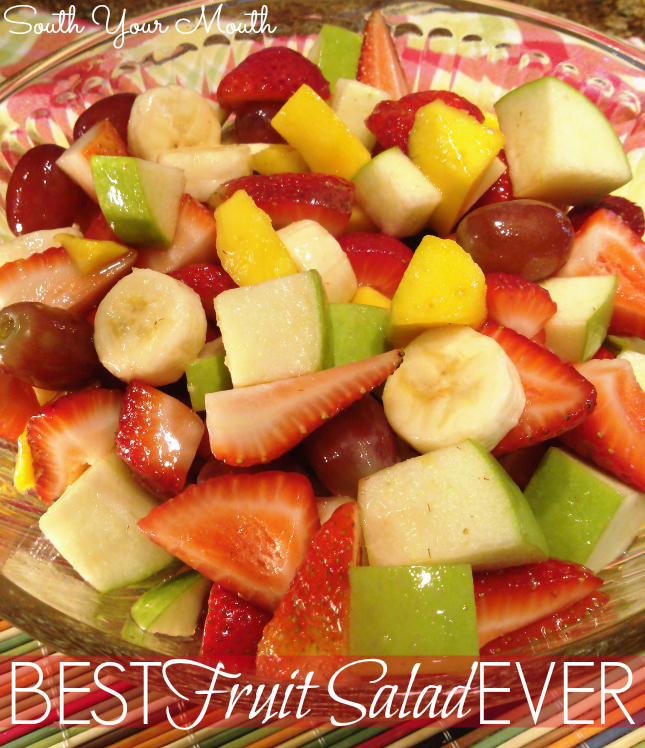 Easy, fresh fruit salad recipe with lemon sugar glaze. This recipe was a pure-T accident. I love to keep fresh fruit around the house – especially this time of year when it’s all so good. To make it more accessible to the onions, I wash and chop it and throw it in a plastic container for easy snacking. Occasionally, I’ll toss a few things together but I wouldn't really call any of it a fruit salad. Well. What had happened was… I’d chopped up some strawberries in a bowl. Then I noticed I had one single lonely green apple. Well, he needed to be with those strawberries. And so did that handful of grapes and half a pineapple (the first time I made this, not this time). I tossed it all together and realized I’d need to do something to the apple or it’d turn brown. So I squeezed the juice of a lemon all over everything. And that made it all sour. So I added sugar to it. And y’all. Y’all. The lemon juice and sugar made this sort of glaze that coated everything and it was glorious! And the lemon really brightens everything up. I even added a banana to it since I had the lemon juice going on and a day later the apples and bananas still had not browned. So, anyway, this is what I do with my fruit now. You can use anything you want (though I’m not sure about melon as I haven’t done that yet). Use what you like. I try to get a variety of flavor, texture and color and usually just buy what looks good at the market or what’s on sale. I always use strawberries, apples and bananas but alternate between mango and pineapple. If I have green grapes, I’ll use a red apple. You get the picture. I made this once with powdered sugar and didn't like the starchiness of it. I've substituted some of the sugar with Splenda and loved that so feel free to try that route if you’d like (just remember you only need half as much Splenda when measuring so 2 tablespoons sugar and 1 tablespoon Splenda would be the equivalent to 1/4 cup of sugar). I like other fancy-pants fruit salads too but I'm telling y'all, there's something about this simple salad that just tastes like summer. I love it! Add all fruit to a large bowl. Combine lemon juice and sugar and stir well (sugar won’t dissolve yet but it will after it’s been with the fruit a few minutes). Serve immediately or cover and refrigerate to store. Made this tonight with cantaloupe, strawberries,fresh pineapple, bananas and mandarin oranges. Very good! Will make this all summer! It's also very good if you add canned pineapple, and mix the canned pineapple juice with sugar. That's the way my mom always made it and it is soo good and soo simple! I'll have to try it with lemon. Is using splenda bad?? I'm a diabetic. This looks great. I made this today and used 2 tsp of Sweet N Low to the juice of one lemon and it was YUMMY! I make a fall version with apples, pears, grapes and other late season fruits in the same dressing, BUT I mix in cinnamon to taste for a great side for a football tailgate party.